Wonderful time, thank you for a lovely Japan tour. Although a week early for full bloom on cherry blossoms, the sights were gorgeous / breathtaking / inspiring / beautiful / splendid / wonderful / delightful. 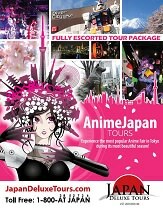 Apart from beautiful aesthetics, the preparations taken by Japan Deluxe Tours were incredible. All the hotels were marvelous stays. Our tour guides Chiko and Ricky were both splendid. Greatly enjoyed having them as our guide and learning about each sight on our tour from them. Wonderful time, thank you for a lovely Japan tour. Absolutely loved Prince Park Tower Tokyo. Enjoyed the experience on traditional tatami. Not a fan of fish/ seafood in general but it did not take away from the experience, fewer buffets. Our tour guide Chiko and Rocky were FANTASTIC. Both were very personable, funny and familiar with all the topic. More sights, less shopping. The free time in Tokyo was great. A little more for Kyoto and Osaka would be great for exploring.